One of the other things the girls have been collecting during our recent explorations are pine cones. In our community, there are some beautiful and prolific pine trees that line the main thoroughfare. Have you ever noticed how pine cones change after a few days of rain? This is an easy experiment to do with very common (and free!) materials. The first thing you need to do is collect your pine cones. No, safety helmets are not required attire. (Ha! I just had a hilarious image of pine trees shooting their cones at us to ward off my little nature collectors. Sorry... its late!) We just happened to do our collecting during one of our bike trips around the neighborhood. 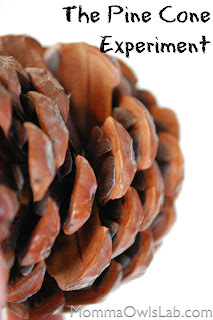 Encourage your child to find a variety of pine cones; small to large and closed to open. For the experiment, you really just need open pine cones, but your child will get more out of the sorting process if they have a variety with which to work. It is best to do this when there have been a few dry days in a row so that the mature pine cones are open. Once you have collected your pine cones have your child sort them into piles with similar characteristics. Guide them to sorting out the open pines cones (like those on the right in the picture below) from the closed pine cones (like those on the left in the picture below). They could also sort based on other characteristics such as length, color, etc. in addition to the open/closed. If you have picked pine cones from different trees then the cones may help you identify them, along with observations of the number of needles in each cluster, length of the needles or cones (great practice in measurement! ), color, etc. (Here's a key (pdf) that may help.) The closed pine cones are ones that are not mature yet; the maturation process takes anywhere from 1 to 3 years depending on the type of pine and weather conditions. My girls were a bit confused about which part of the pine cone was the seed or if the whole pine cone was considered the seed. Pine cone seeds are found in pairs under each of the scales of the pine cone (except the top and bottom ones, where are too small). They are interesting, often winged seeds (similar to maples) that rely on the wind for seed dispersal. 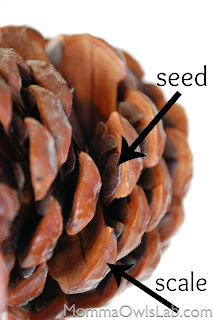 To get a better idea of the seed, take a kitchen towel and place the pine cone inside. Then, carefully twist the pine cone back and forth a few times. Open the towel and you should see some of the seeds have been released. Have your child examine it (with the magnifying glass if they prefer) and then let it fly so you can also observe how it travels in the air. Now for the water! Take a few of your open pine cones and place them in a container of water for at least an hour. Have your child describe what the pine cones look like at the beginning and/or write it down in their science journal. Also have them make a prediction of what they think will happen. Make sure to keep at least one open pine cone nearby (not in the water) so that you can use it as a comparison. Ta da! The open pine cone has magically become a closed pine cone! Okay, not quite magic - it's science! Have your child make observations of the pine cone and evaluate their earlier prediction. Also have them infer as to why they think the pine cone closes when exposed to water. You can then take the pine cone out of the water and leave it to dry. Depending on the weather conditions, it may take a few days to dry out - or you can hurry it along by placing it in the sun or even using a hair dryer. This is a great example of an adaptation, or a characteristic that has evolved to give better odds of survival for an individual or its offspring. Wet weather causes the base of each scale to swell, resulting in the scale itself curving inward. This action causes the pine cone to "close" and protect its seeds. Remember that the pine cone seeds are often dispersed by wind. The advantage to closing during times of wet weather is to prevent the seeds from being released when it would be more difficult for the seed to travel any distance. When the pine cone dries out, its scales will reopen and seeds are then able to be dispersed into the environment. Can't find any pine cones or just want to see the phenomenon rightnow? Check out this YouTube video. Once you've done the experiment, don't dispose of the pine cone! You could use it to make a Pine Cone Bird Feeder by smearing it in peanut butter and then rolling it in birdseed. Or, check out these Pinterest boards devoted to the Art of the Pine Cone. For older kids, consider making a pine cone hygrometer - a device that can measure the relative humidity of the air. Check out the instructions found on the Happy Scientist. Visit the science process skills page for more information on the different skills. I LOVE, LOVE, LOVE this pinecone study. I also LOVE that you include the science process skills for the activity! I am hosting a STEM-themed linky party this week, would LOVE to see you link to this post! I'm going to go look around your site, so glad to have found you! This is absolutely AMAZING!! Thank you so much for sharing this!! the project look realy cool.my son and I are going to try to do the experiment. On the off chance that you need a lovely partner with a Pakistani Escorts or wish to go to supper in a wonderful organization, gathering or meeting with a beguiling and rich lady then you should get in touch with us at +923098998125 Lahore Escorts.